England ended the Costa Ballena Octagonal match in Spain on a high after sweeping away with the singles to beat Portugal 5.5-0.5. The foursomes were cancelled because of fog, but when the players got out for the singles they meant business. They won all five matches on the course and also claimed a half for the game of Joe Long, who withdrew from the tournament with a foot injury. Sam Done (6/5) and Ben Hutchinson (6/4) had the biggest wins, followed by David Langley (3/2), Jake Bolton (3/1) and Harry Goddard (2/1). Spain retained the title, beating the Netherlands 4-2. The bronze medal went to Germany, beating Iceland 4.5-1.5. The remaining places were taken by Finland, Italy, England and Portugal. 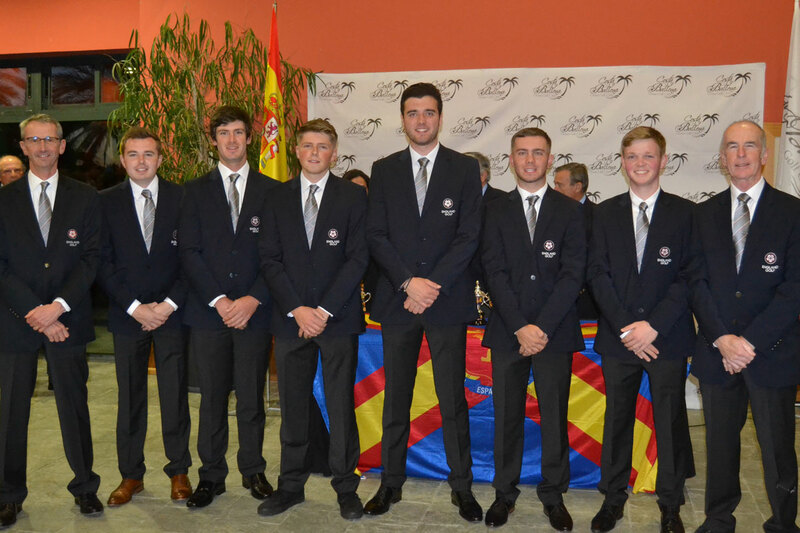 England’s hopes of a medal in the Costa Ballena Octagonal match in Spain were dashed yesterday when the team lost to Germany 5.5-3.5 on the final day of the group stage. A win would have put England in a tie to defend last year’s bronze medal, but now they play Portugal for place. The team made a good start to the match against Germany, leading 2-1 after the morning foursomes. Harry Goddard and Jake Bolton paired up to halve their game, are were followed by David Langley and Ben Hutchinson, who won on the 18th. The third game was shared after Joe Long’s withdrawal with a foot injury. But the afternoon singles went Germany’s way, with just Jake Bolton and Sam Done squeezing halved results from their games. Long’s game was also scored as a half. The championship final is between last year’s winners, Spain, and the Netherlands. German and Iceland will play to decide the bronze medal. Defending champions Spain pulled off a remarkable singles performance to thwart England 6-3 on the second day of the Costa Ballena Octagonal match in Spain. England got off to a great start, with two fighting performances, to lead 2.5-0.5 after the morning singles. Harry Goddard and Jake Bolton were all square after 12 holes but battled away to win 1up. The same spirit drove David Langley and Ben Hutchinson, who were two down after 12 but were back on level terms after 14 and also went on to win 1 up. The team’s morning scoreline was completed by the half point allocated to the final game after Joe Long had to withdraw from the tournament with a foot injury. With half a point straight in the bag from Long’s singles, England needed just two points from the afternoon’s sessions for the win. But Spain had other ideas and, although Harry Goddard, Sam Done and Ben Hutchinson all went to the 18th, the hosts completed a clean sweep of the live games to score their second win of the championship. England made a winning start to the Costa Ballena Octagonal match in Spain with a 5.5-3.5 win over Finland. They got off to a good start with a 2-1 lead after the morning foursomes. Jake Bolton and Sam Done pushed ahead after the turn to secure their 2/1 win, while David Langley and Ben Hutchinson halved their game. The third game was scored as a half, following the withdrawal of Joe Long who has a foot injury and is unable to play in the tournament. In the afternoon singles, the team forged further ahead with big wins from Harry Goddard (6/5), Langley (4/3) and Hutchinson (6/5). Tomorrow, England will play the hosts and defending champions, Spain. They will complete their group stage with a match against Germany on Thursday. The other group involves Italy, Iceland, Holland and Portugal. The winners of both groups will play the final on Friday, with the other teams playing-off for places. Last year England won the bronze medal, fighting back from disappointment after they were unbeaten in the group stage but missed out on a place in the final on countback.